You are here: Home / Decor / Making Stairs Safe. 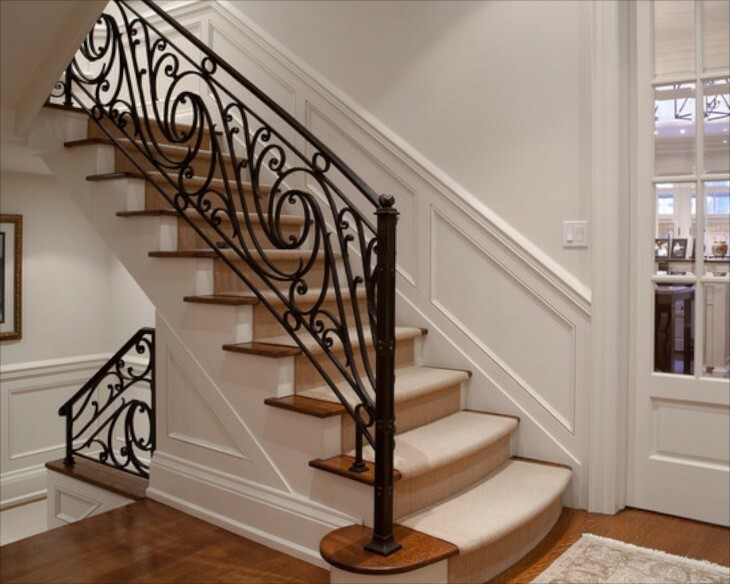 Stairs are a necessary component in homes and businesses. Although functional, they can also be a design statement. 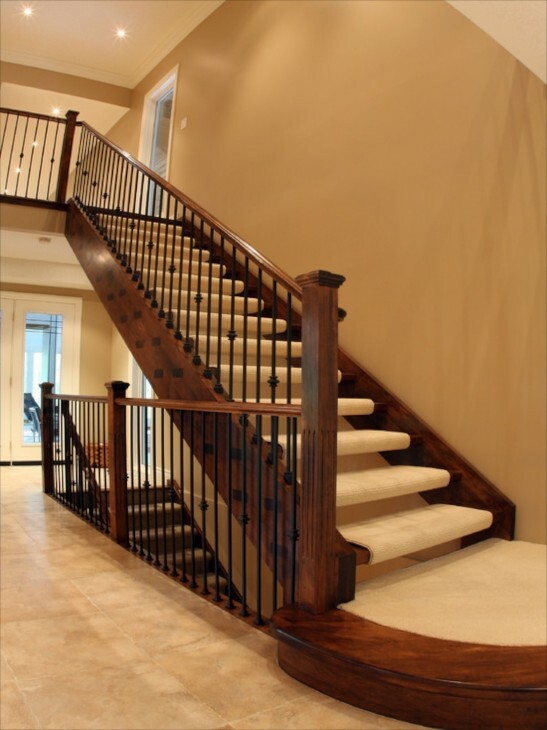 The building of stairs, as well as most construction, has mandatory guidelines regarding how they are built, and they can often be confusing, misinterpreted, and complex, although as we will see below, extremely important. Their are international codes, national and state codes and and local codes that can sometimes seem contradictory. Their main purpose, even if often seems misdirected, is aimed at safety. Doing the research for this article, it was difficult to come up with the most current code, as they have changed. Residential is different than commercial. On top of that you have OSHA input. This post is being done at reader request. 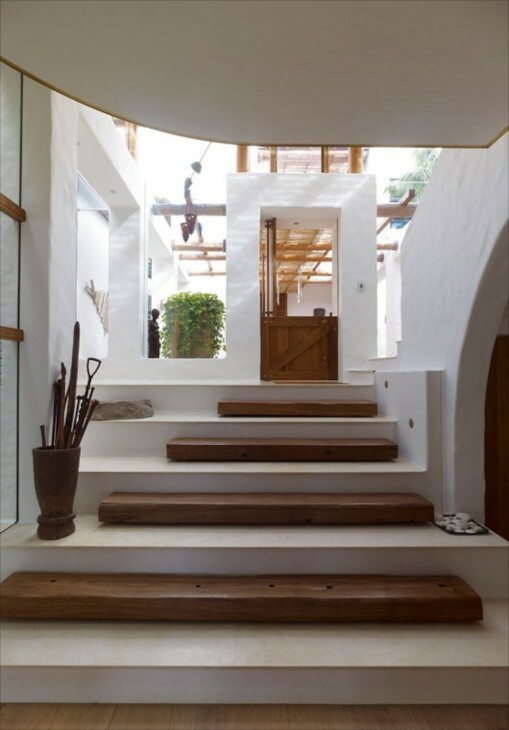 I am not going to deal with the technicalities of building stairs, but with the issue of how to make them safe, using good design and hopefully some common sense, so that a fall is less likely, while keeping in mind architectural and design decisions as well. Thankfully, this reader had a spouse who took a fall but was unhurt, and they are looking for some ideas for their front and back stairs. I had actually had this post on a list, but moved it up. If you are looking for some technical info, I will provide links, the most current I could find, at the end of the post. 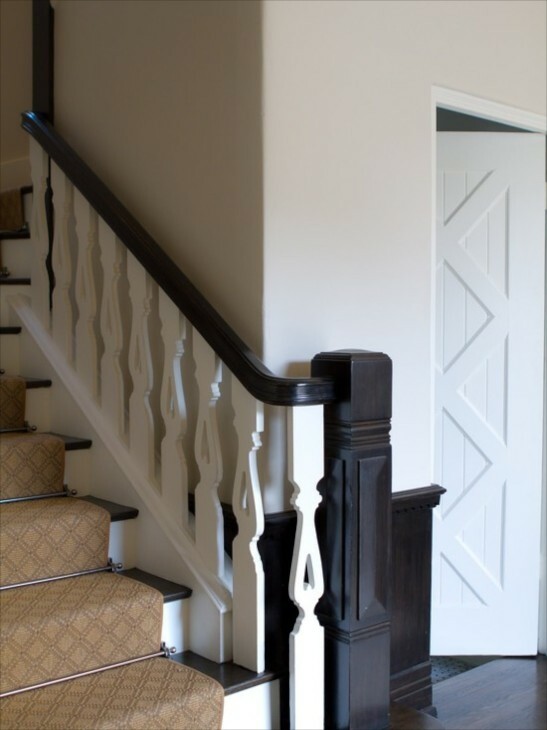 This post will offer some design solutions for your consideration. Below are examples for most decor preferences. 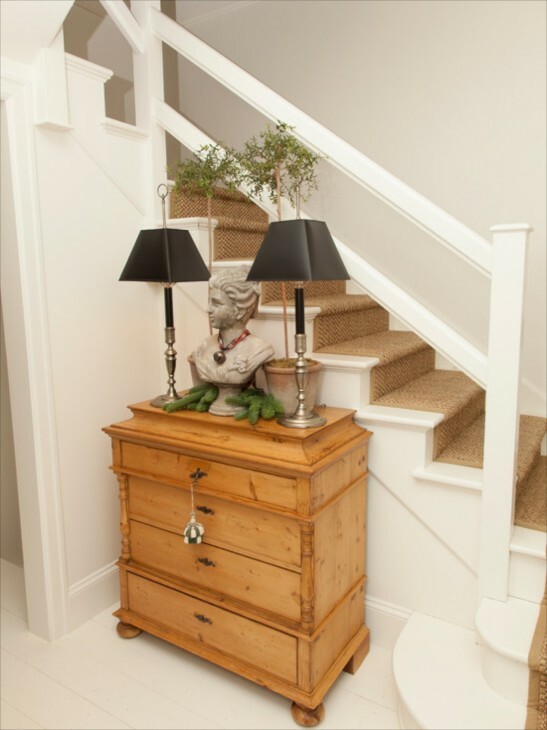 Foyers and stairs are usually the first thing to catch our attention when we enter a home. They also hold the most potential for accidents in the home. 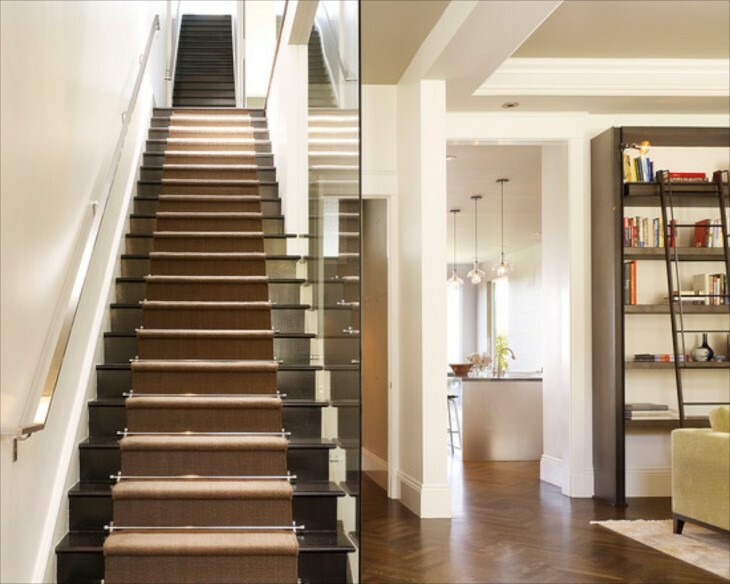 There are stairs that are modern, traditional, transitional, and more. No matter their design, here are some sobering statistics: among unintended injuries, stair falls are second only to automobile crashes. Children and seniors are at greatest risk, and the greatest risk is due to slipping. source. 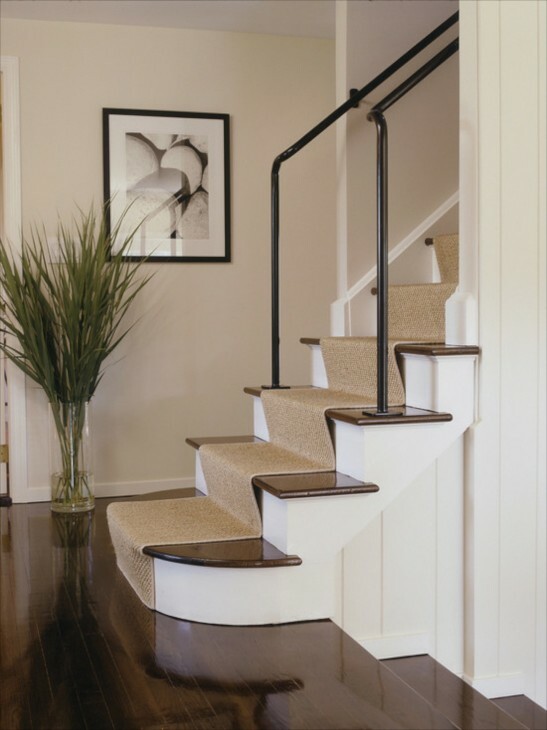 The National Safety Council reports 12,000 deaths a year from stair falls, with half of these deaths in the home. source. I myself had no idea it was that many. There is some thought it may be even higher because some of these stair accidents and deaths go unreported as such for many reasons. Although obstacles such as toys or items left about caused some, most were due to lack of handrails and incorrect riser or tread measurements, as well as variability of the bottom riser to the first step. Varability of even one quarter of an inch can cause an accident….yes, 1/4 inch. Also, unexpected location of stairs leads to many falls. For example, stairs of just one or two steps in a hallway or doorway can be especially hazardous. source. 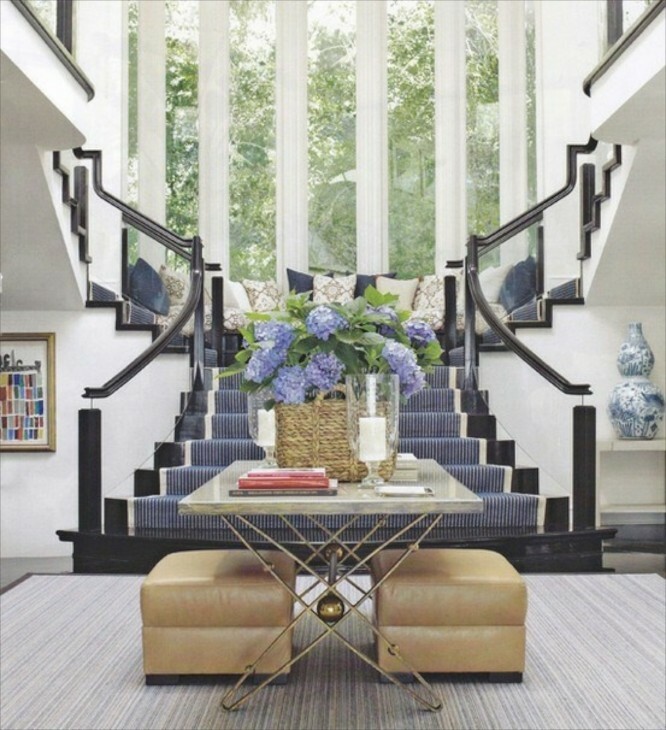 One of my concerns personally as a designer has been the one or two steps we often see from the garage to the house. So easy to trip on. 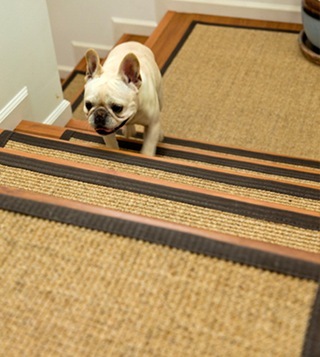 Here I see two areas of concern…..the tread depth at the bottom stair is deeper than the rest. In addition the carpet is loosely adhered to the underside of the tread than I care to see. I am also surprised to see no newell post or rail all the way to the bottom. There isn’t even a wall to use for balance at the bottom. If you were to reach for the rail before taking the first step, I dare say, you might fall or trip when taking the first step. Here we see bare stairs where the riser and tread are the same color, which in the dark can often present difficulties. Fortunately there is lighting that helps tremendously. 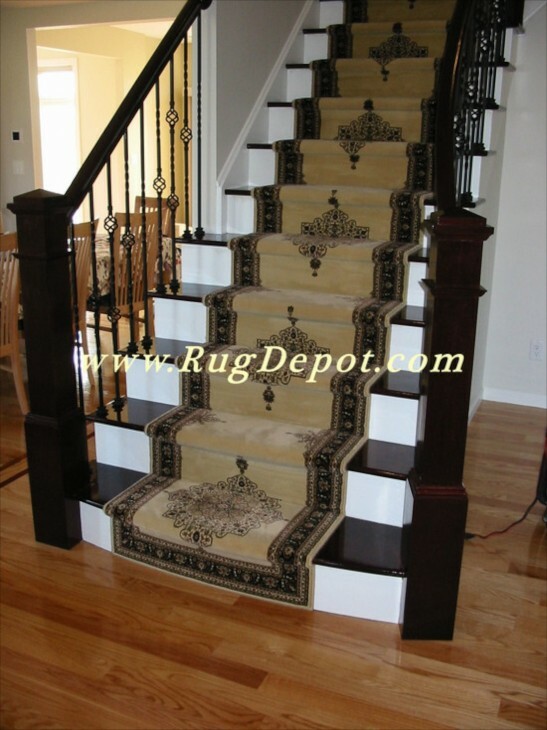 Here painted risers help visually, but as I mentioned, data shows that just a few stairs presents safety hazards. Visual and or tactile clues will help and that is what I have included below, as well as some considerations for design choices, including some that are common, but potentially serious safety hazards. Design considerations do inform safety. 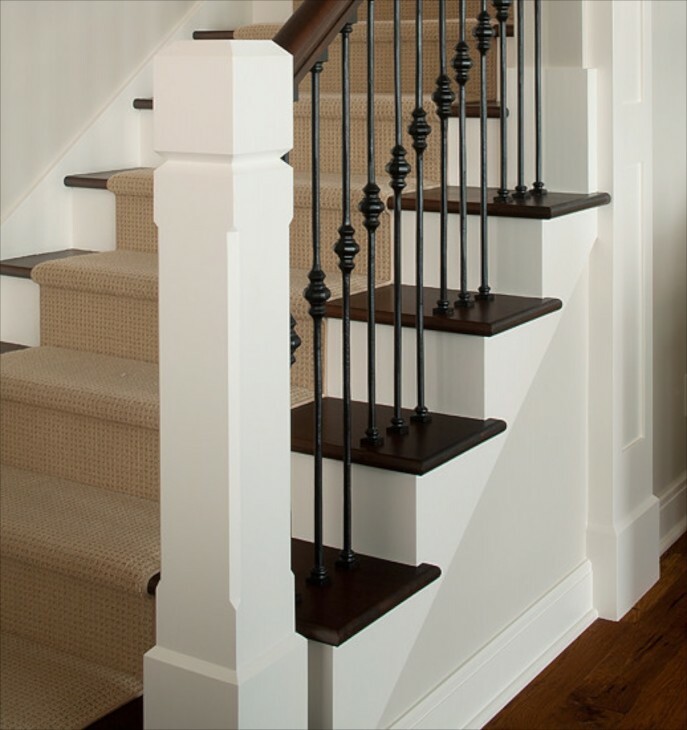 For example, besides riser height, the shape of the stair rail also does. Grip strength has been studied on varying shapes of rail both in children and adults. The distance of the rail from the wall as well. This is why the codes are so specific. source. 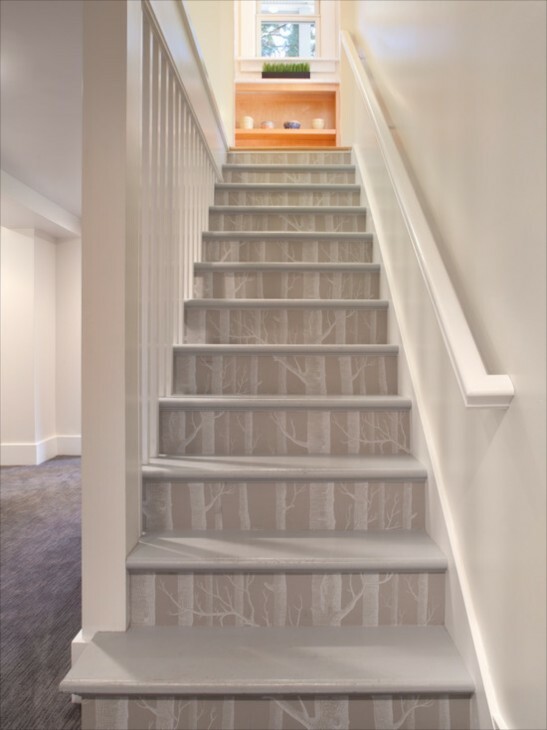 Something as simple as stair tread covering can make a difference. 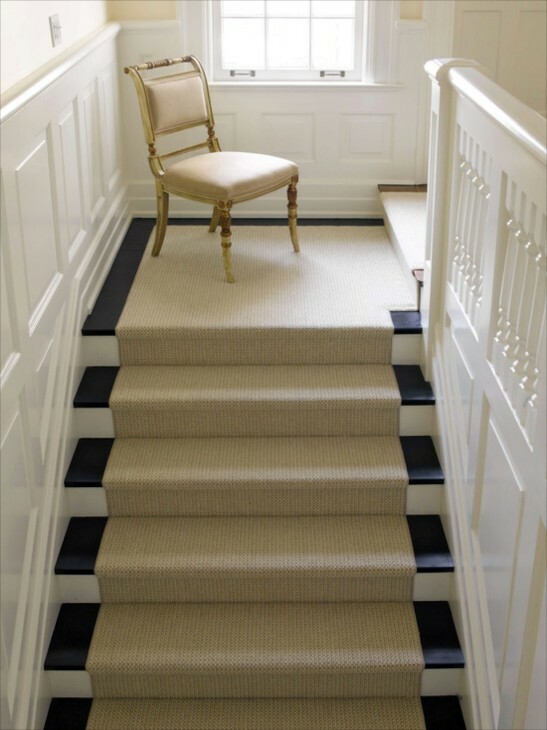 Here, a sisal with a simple plain border creates a visual cue to the person, or even animal going up and more importantly, down the stairs. Most accidents happen coming down the stairs. 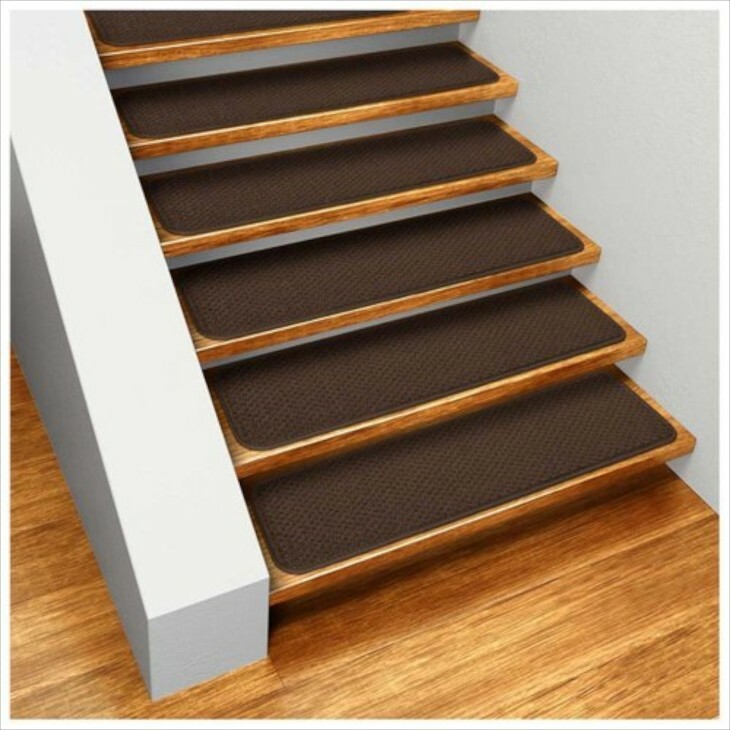 A simple textured rubber or vinyl tread cover provides a good grip on open stairs, and particularly on stairs in a garage. The all white stairs here benefit tremendously by lighting. 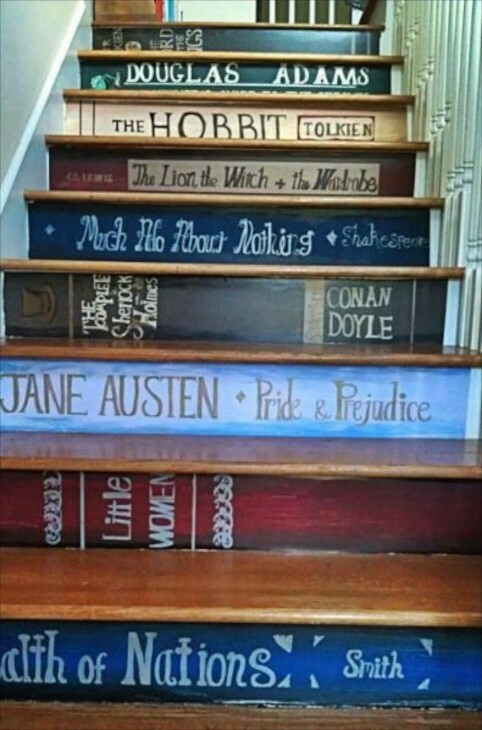 These are beautiful stairs. Good contrast between the risers and the treads. 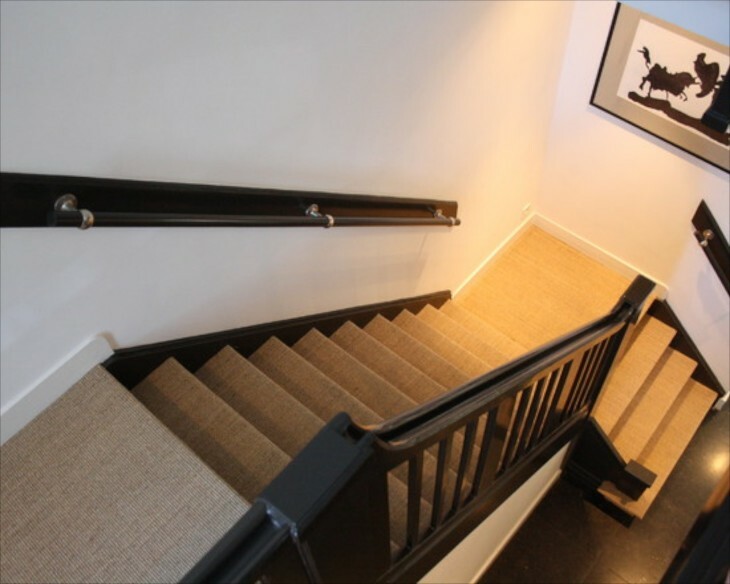 Although there is no handrail on the right, on the left you can barely see a rail that goes all the way down to the first step so that anyone going up or down the stairs has support. I like the oversized carpet tiles in a geometric pattern on the floor. Hopefully, there is a method used that makes sure the carpet is “secured” to the floor by some means, such as a rubber pad. 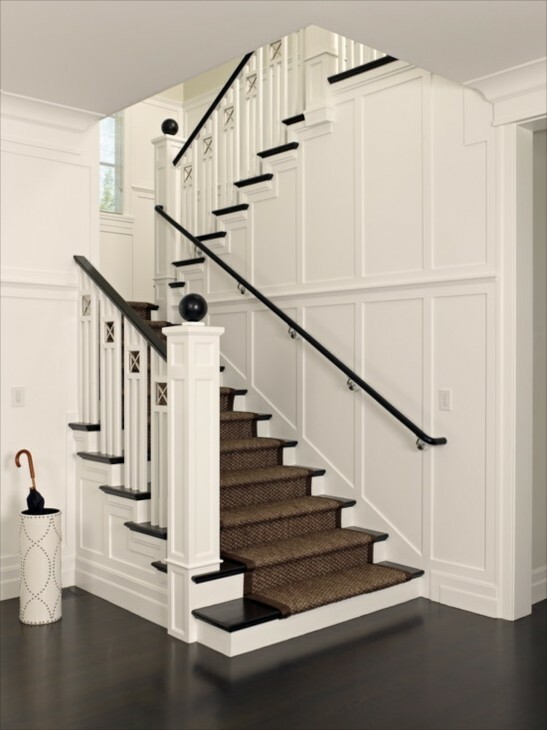 Here in this all white foyer, the stair riser are done in different colors, making the risers highly visible. Here the homeowner used book binding as inspiration for painting the risers. 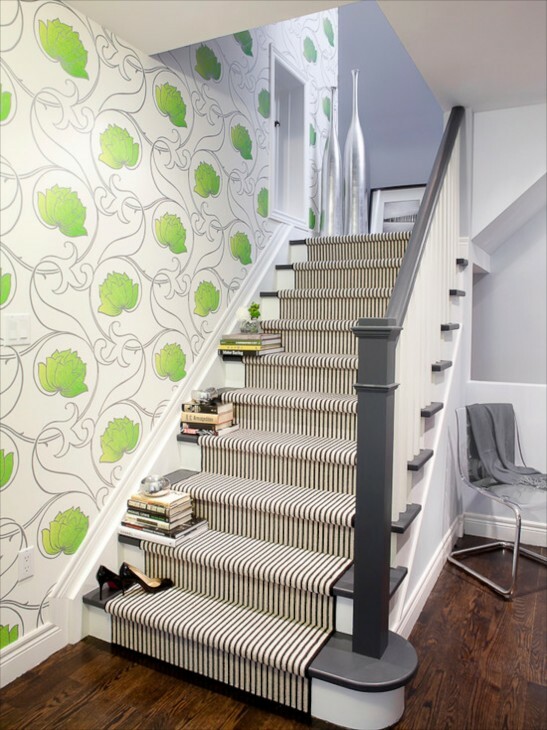 Wallpaper is attached to the risers for a monochromatic look that still differentiates the risers from the treads. 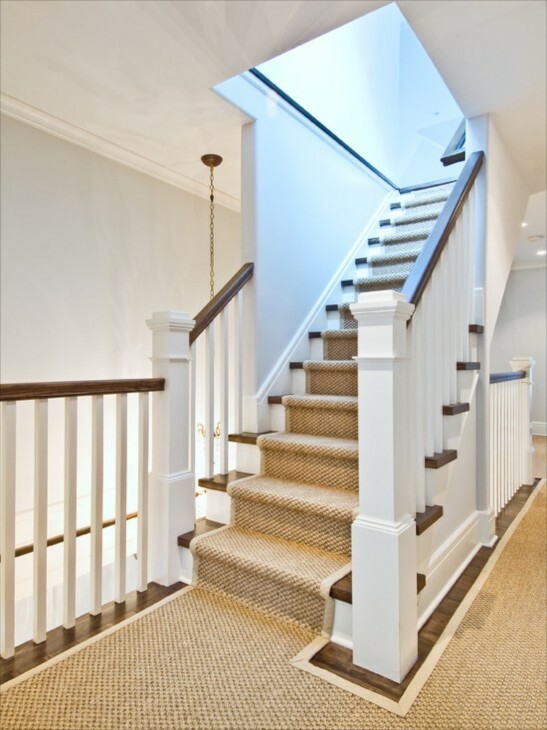 This homeowner chose to cover the stair risers and treads with a natural sisal runner. Because of the texture, the climber can feel more secure. I don’t think the rail meets code. Noticed how securely the carpet is attached at the bottom of the riser and underneath the bullnose of the tread. Interesting and dramatic, but an accident waiting to happen. 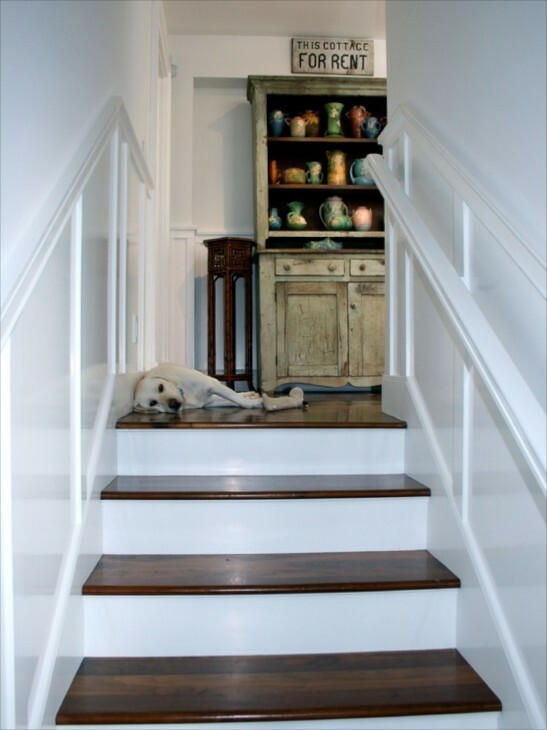 If one was to run up these stairs it would be easy to trip, especially easy to catch a toe under the stained wood step. I also think that although these stairs are beautiful, and probably gorgeous at night. But there is no rail on either side after the first platform where the stairs turn. Code require that in a long run of stairs past a certain length, there has to be a platform, or resting place. This staircase has two. 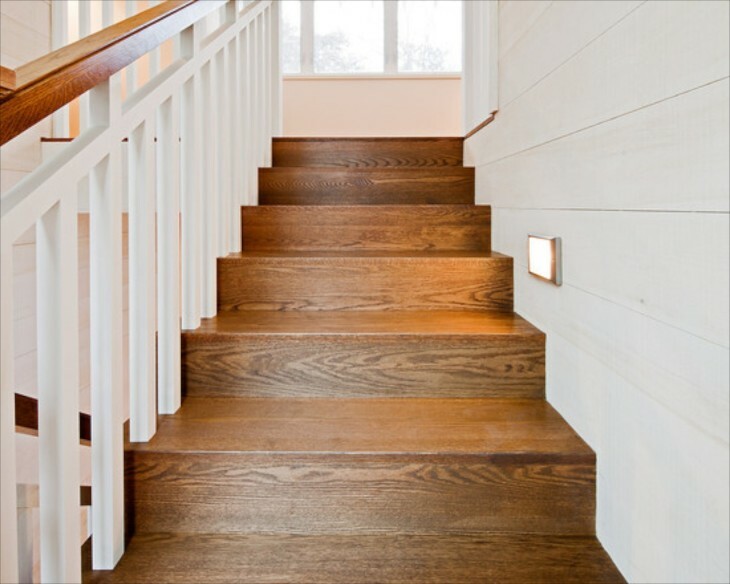 Code has stringent requirements regarding the tread and riser measurements even for curved stair cases. 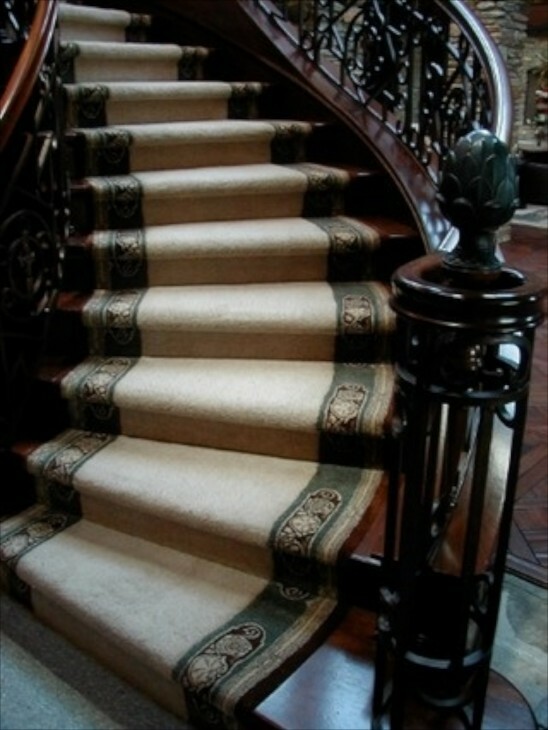 Here we see carpeted stairs. 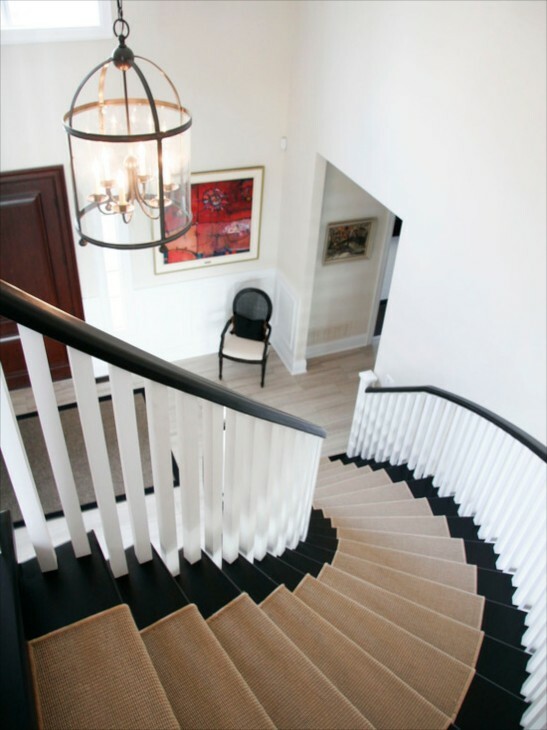 It takes a real expert carpet installer to do a curved staircase, and it takes a lot of square yards of carpet as well. You may be surprised! Tread covers…….a marketing sample photo. Tread covers. 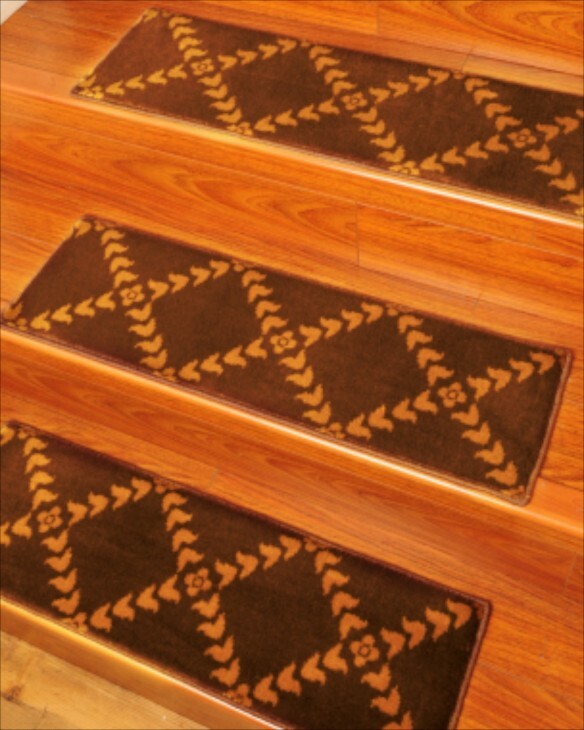 Notice that they are wide enough that your feet will be on them as you climb or defend the stairs holding the rail. Here the carpet is tightly attached to the treads, but I am not a fan of such a highly textured carpet like this from a cleaning perspective. 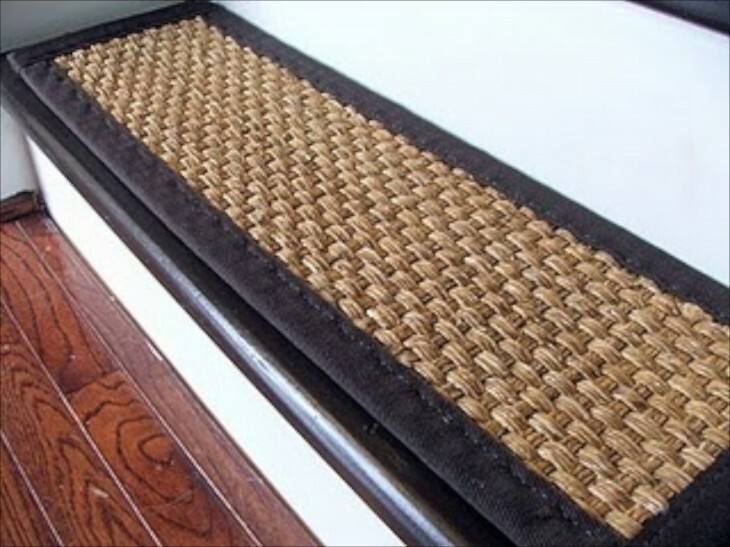 A sisal tread cover. I have concerns about tripping because the contrasting binding could catch a toe going up the stairs. Here the tread is secured by velcro, but I still have the same concerns. 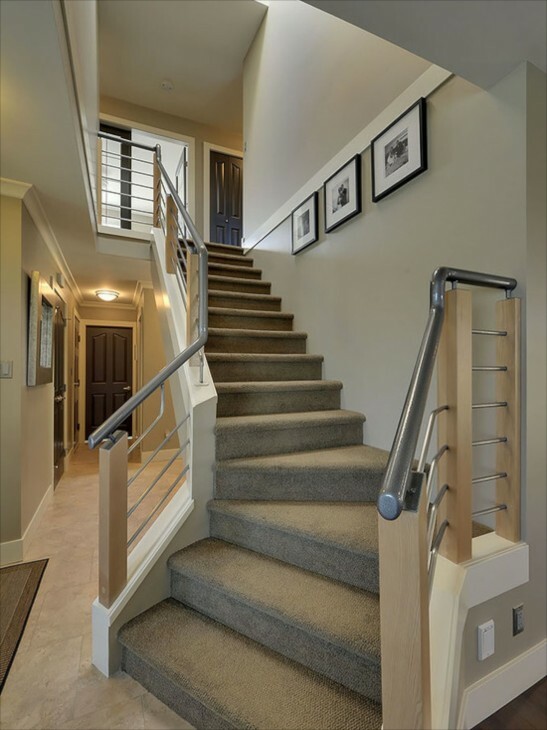 Here is a good example of a stair runner that isn’t going to offer the maximum help if the user needs to use the rail from the bottom. It should have been wider to start with, even though it would come closer to the sides as it went higher up. 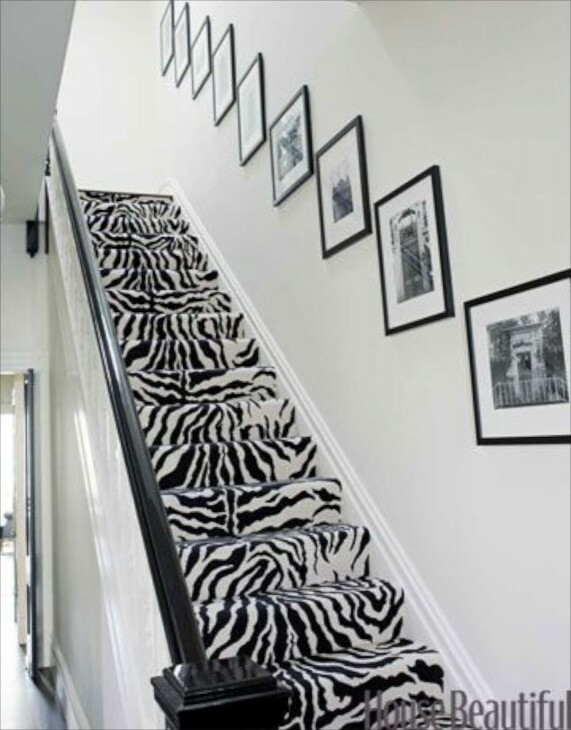 Although not my decor style, it does illustrate how a wider capet offers increased safety. 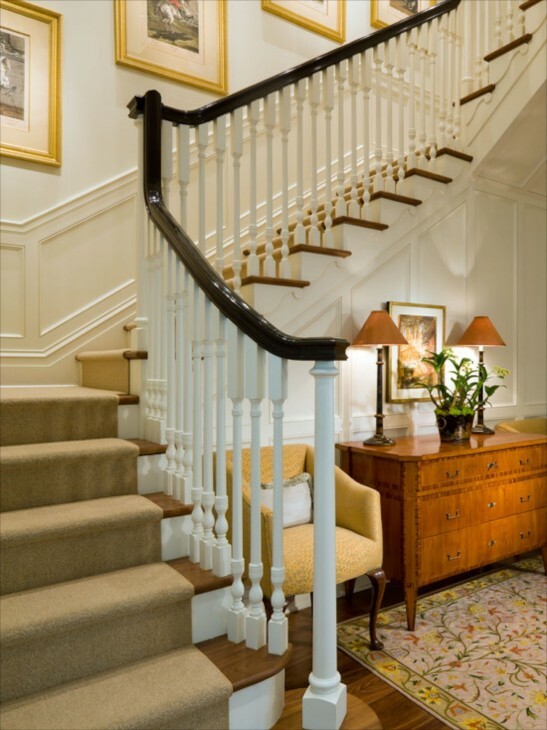 A good example of a carpet that looks balanced style wise, neutral color and wide enough for gripping the rail and having the safety of carpet underneath. 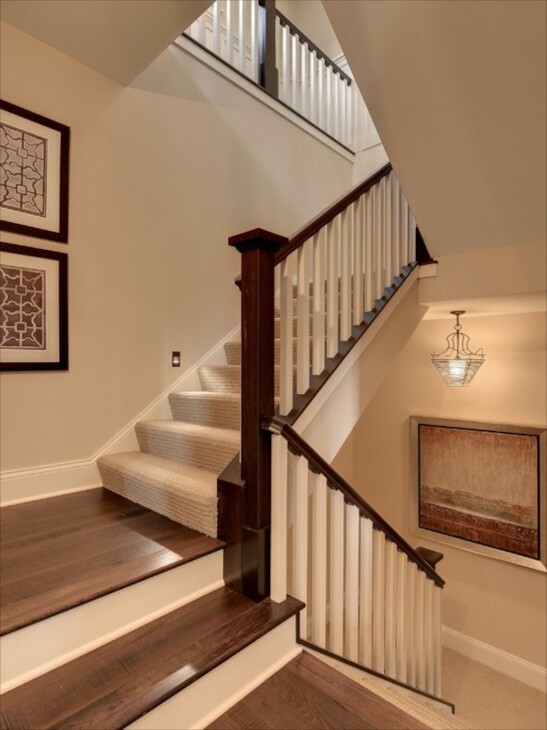 Here is another example of a wider at the bottom than the top staircase with carpeting that stays close enough to the side for safety and comfort. From a design standpoint I really like this….the color and pattern is beautiful against the black rails, risers and treads. 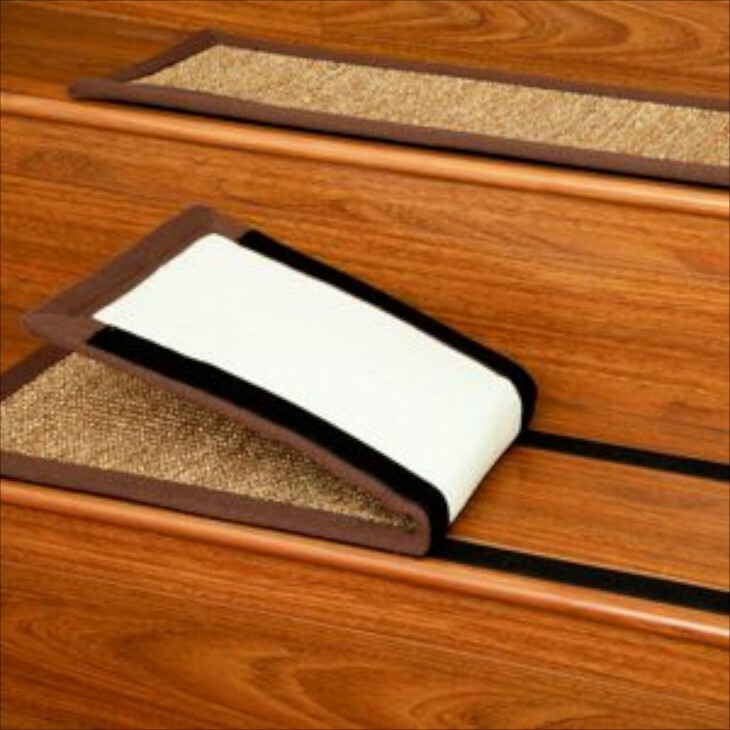 The white border on the edges of the carpet runner connects the entire stir case to the wall color. 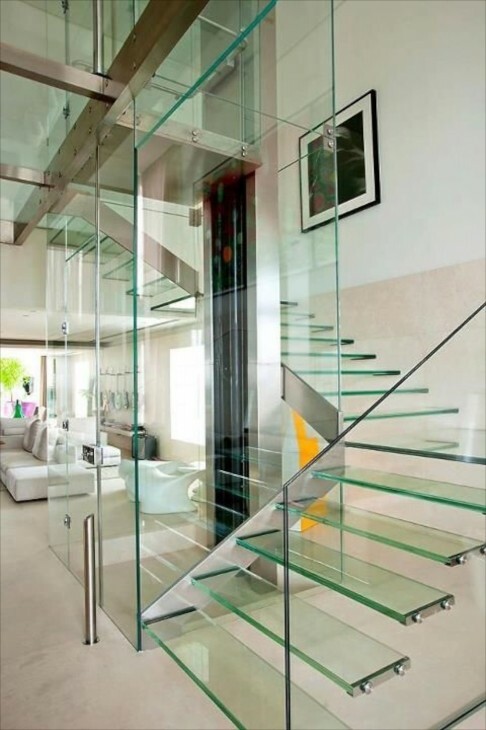 The use of glass in place of spindles is modern yet appropriate. The choice of windows is perfect. 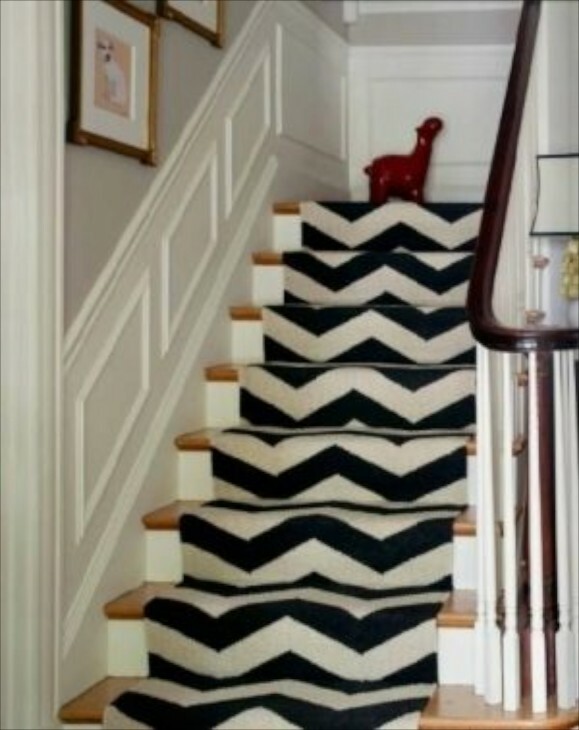 In this scenario I cannot imagine the stairs without carpeting. It would be quite cold looking. The colors all meld together. I probably would have chosen a different texture of maybe even thought about a pattern. 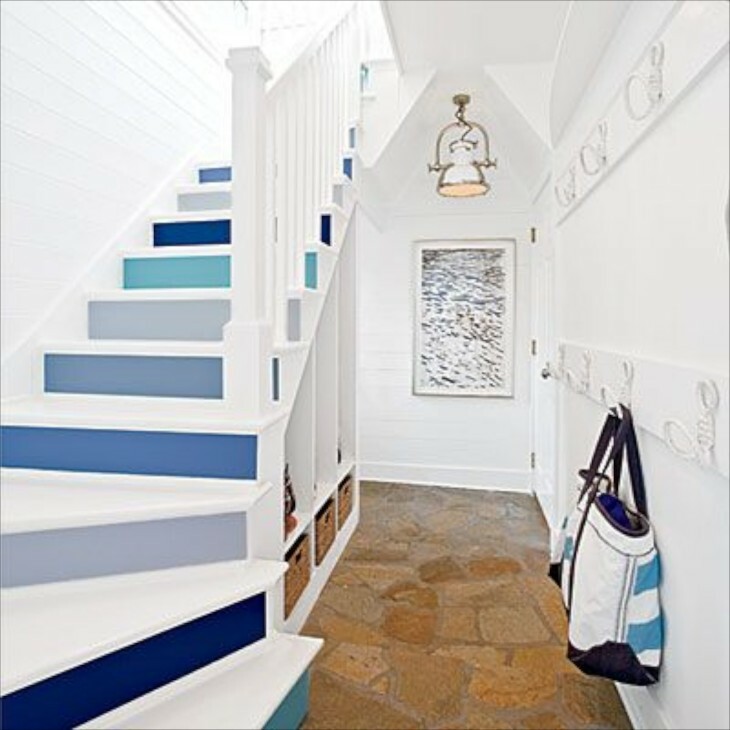 Many homeowners want something bold on the stairs. Because of how each riser has a different colored stripe on each riser, it is a quite bold statement. 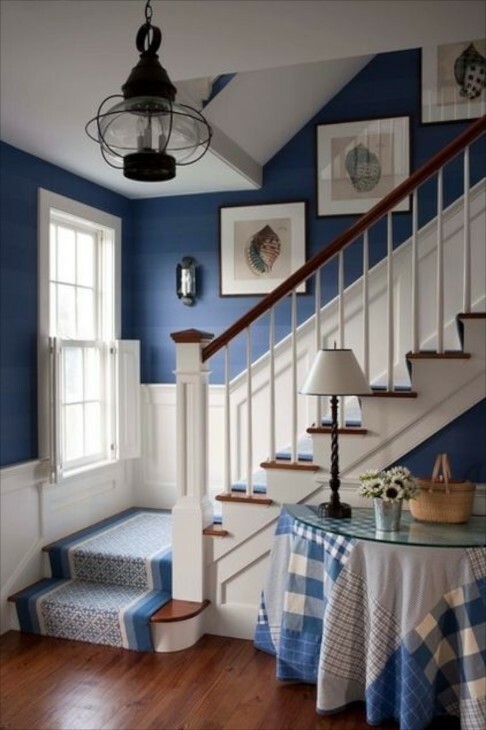 Country decor, all in blue. 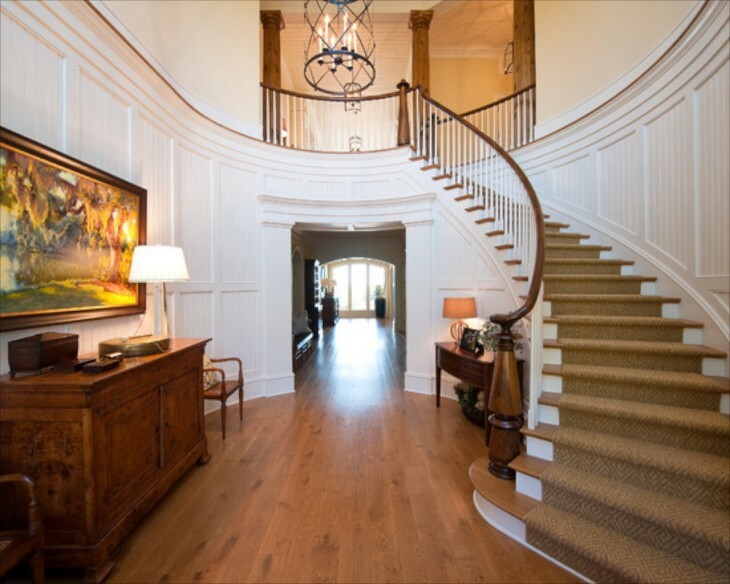 You can begin to see that your foyer and stairs can offers you a chance to express your style preferences right at the entrance to your home. One of the advantages to pattern is that it hides dirt a bit better than a light color. 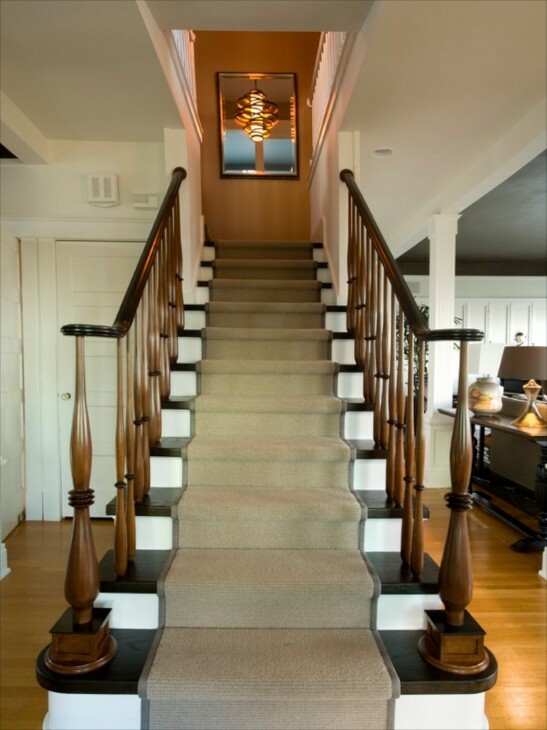 An all white foyer accented in dark wood gets a dose of elegance from a pale patterned carpet stair runner. Pattern is also a great way to hide dirt a bit better. One of my favorite go to runners are sisals. Especially at the beach, it is a terrific choice. 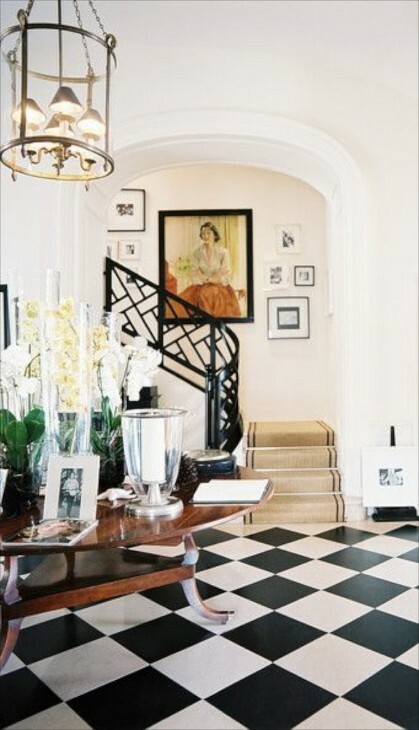 It can look casual or sophisticated, depending on pattern or texture choice, and whether you add a side border or not. 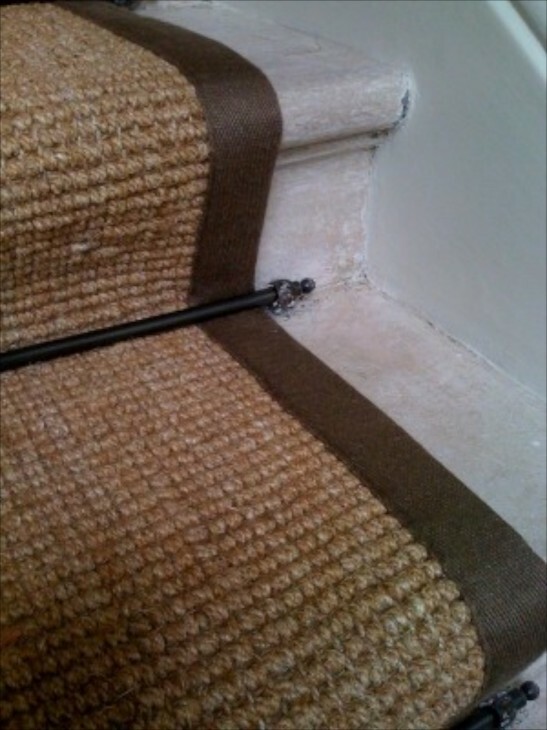 Here the carpet is held firmly in place by stair rods. A choice for a lot of traditional applications, they can be a bit pricy. I like to see the carpet more firmly secured under the riser. A larger “roll” can make it easier to slip. Here you can see easily what I mean. Secured tightly at the bottom of the riser and secured very tightly under the front of the tread. For a more formal runner a medallion pattern will work well. 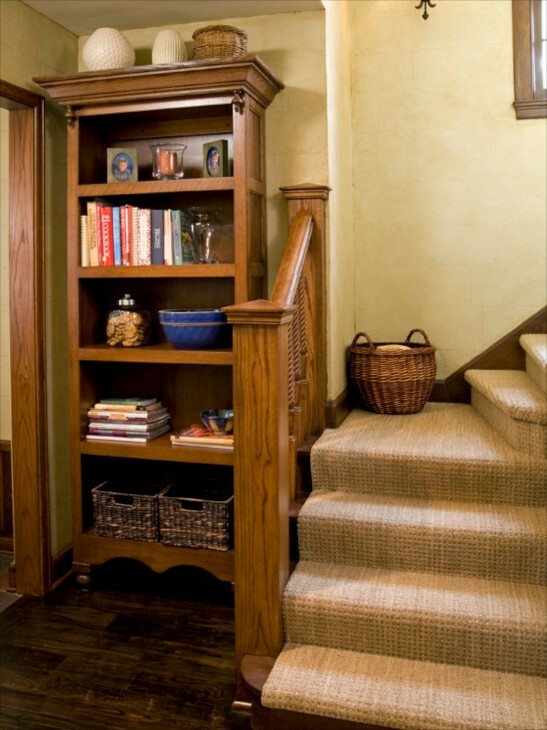 This is the same staircase as above, and a good illustration of how important it is to secure the carpet at the top of the stairs as well, continuing around the corners as well. Nice installation here, that also follows the contours of the walls. The choice here was simple and neutral, but very nice. 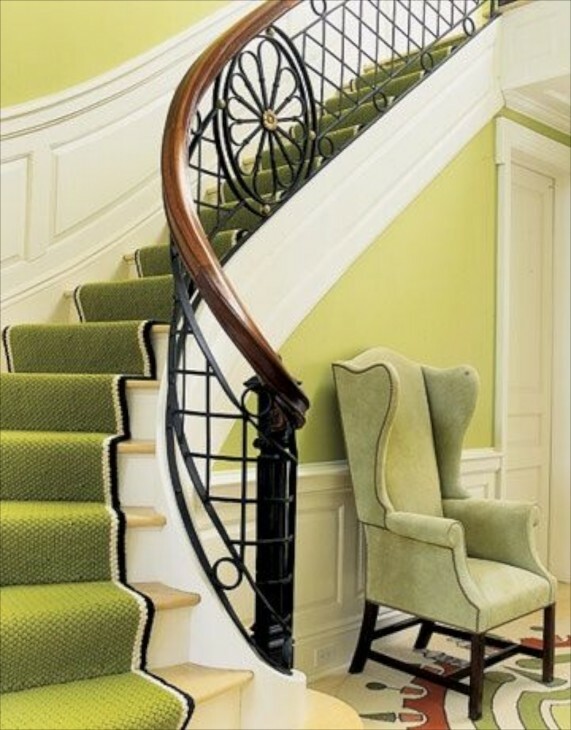 Same color, but on a curved staircase. Above we saw a country foyer in blue. 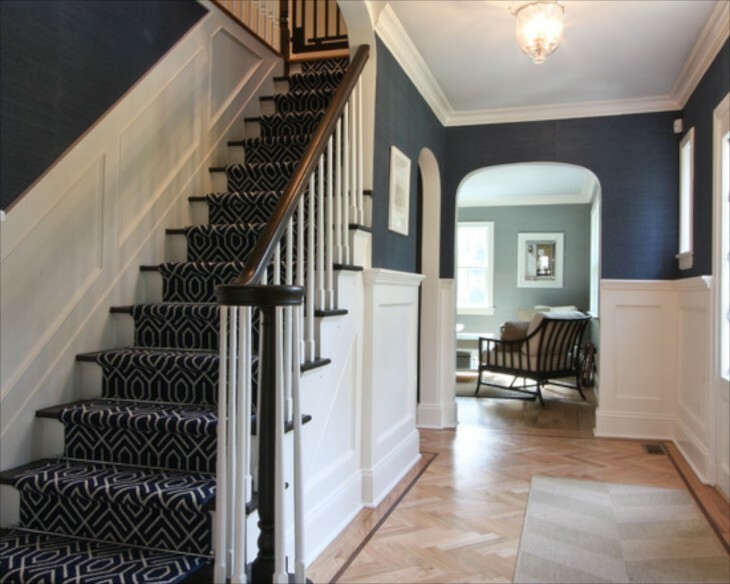 Here the blue lends a more formal air, and the choice of a geometric pattern adds interest and compliments the wall color as well. An example of taking the runner all the way to the edges. The first tread up from the landing is unequal in size from left to right, and at night especially, might present the potential for slipping. 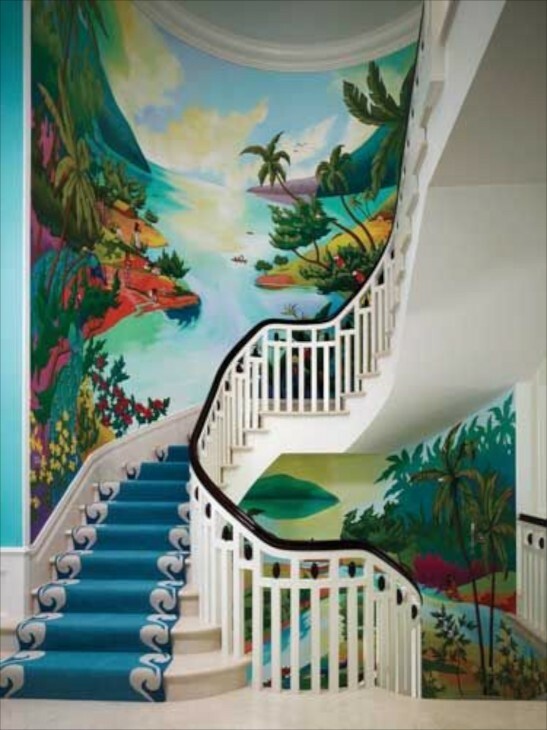 Eclectic and colorful, but the installation is excellent. This really illustrates the difference between a tight install under the tread nose edge and not. You can see here that the tight tuck makes it easy to see each individual stair. imagine it not tucked and it would be more difficult, and the likelihood of tripping enhanced. 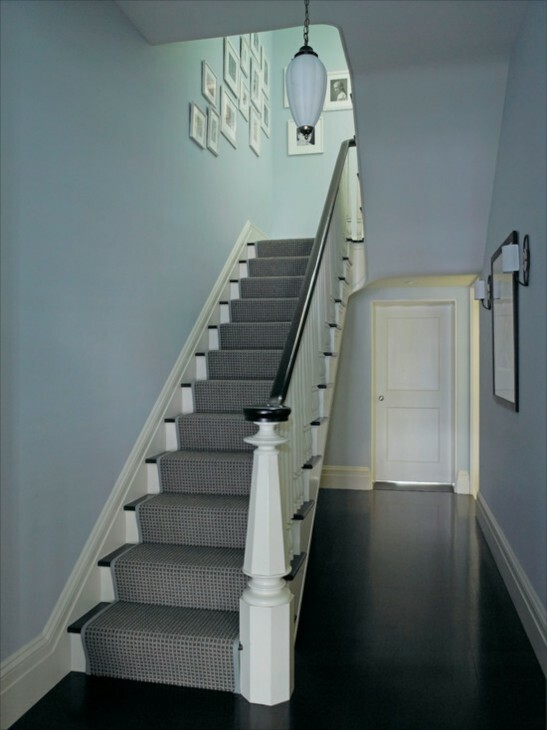 Stair rods and contrasting edging help define each step. 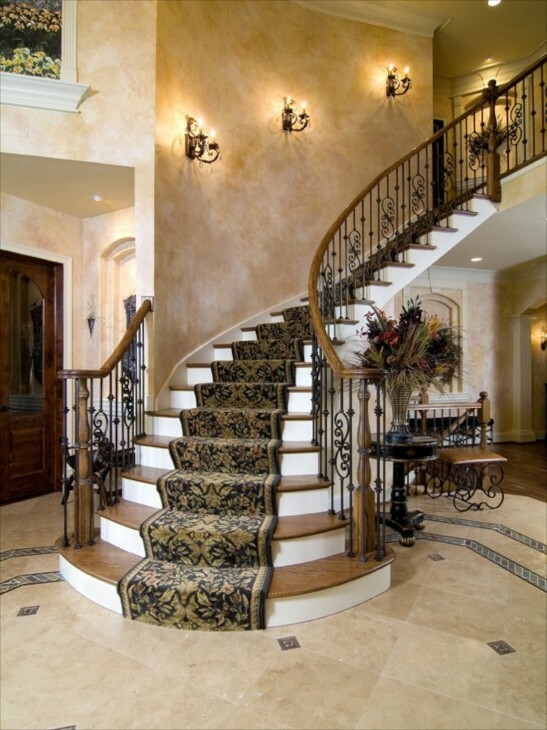 Here, a beautiful staircase and nice carpet choice, but not installed to my standard. Again, the tread edge not tucked tightly under. The same here……so much easier to slide off the edge. I think it especially important to do with geometric patterns, done correctly here. But correct here. 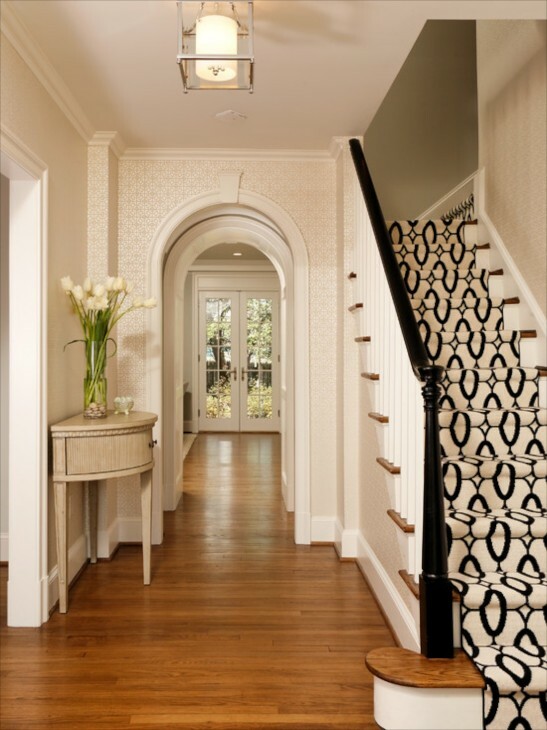 The pattern in the carpet is lovely with the grasscloth on the wall. 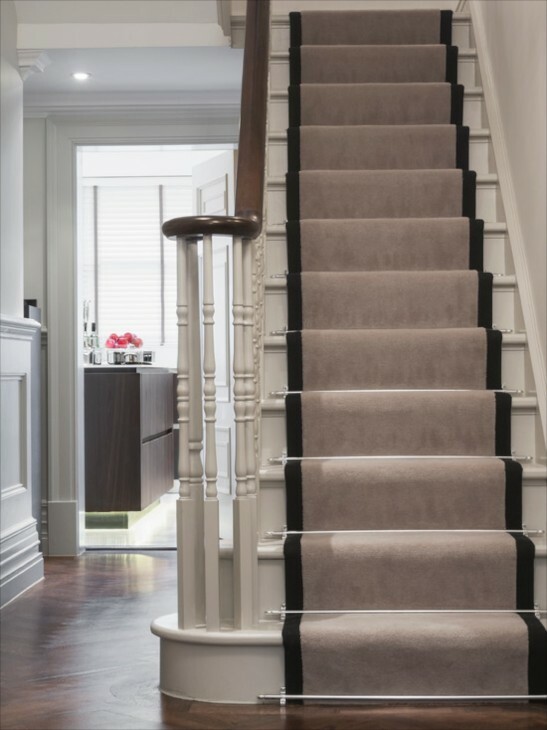 The installer ran the carpet pieces under the front of the tread, and it adds a safety factor, even in a contemporary application like this. Although it is secured by stair rods, I still want to see it tucked under the tread edge. 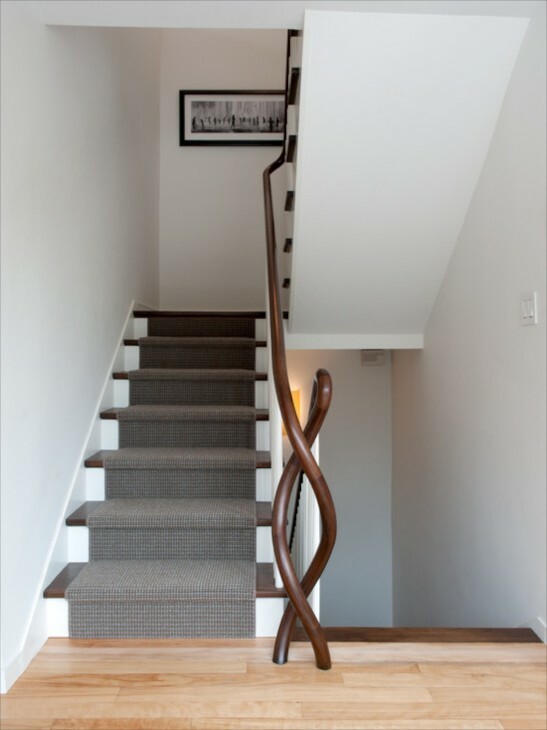 Some stairs do not have an overhang, or bullnose, but not too many. In those cases you have no choice but to have a larger shaped roll at the top. 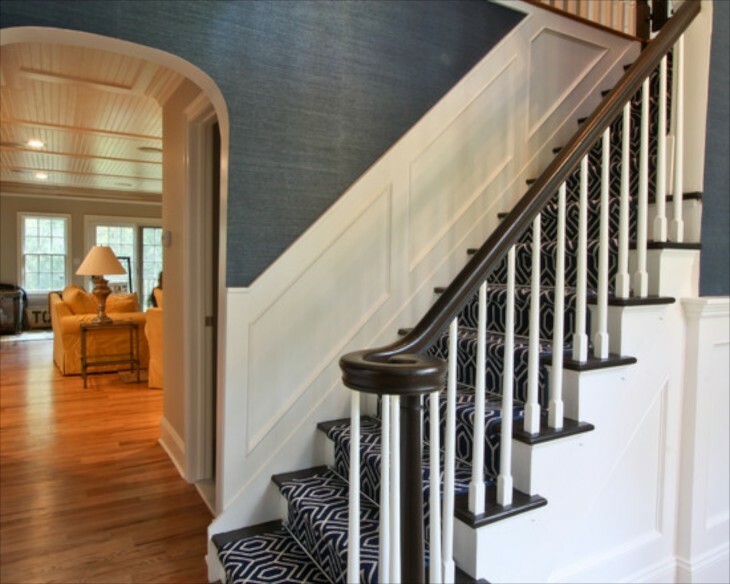 In these cases, the type and texture choice for your carpet can help. 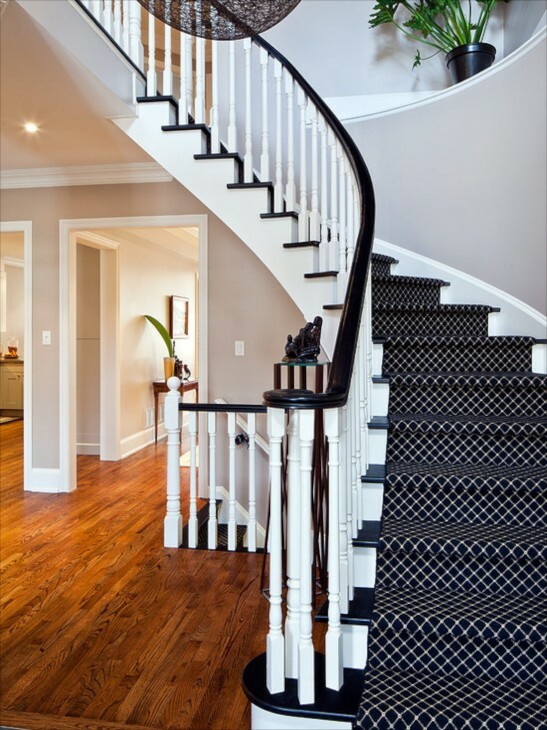 Here stripes help to make the user aware of not just the curve of the staircase, but of the varying tread dimensions. Good color, pattern, and install. 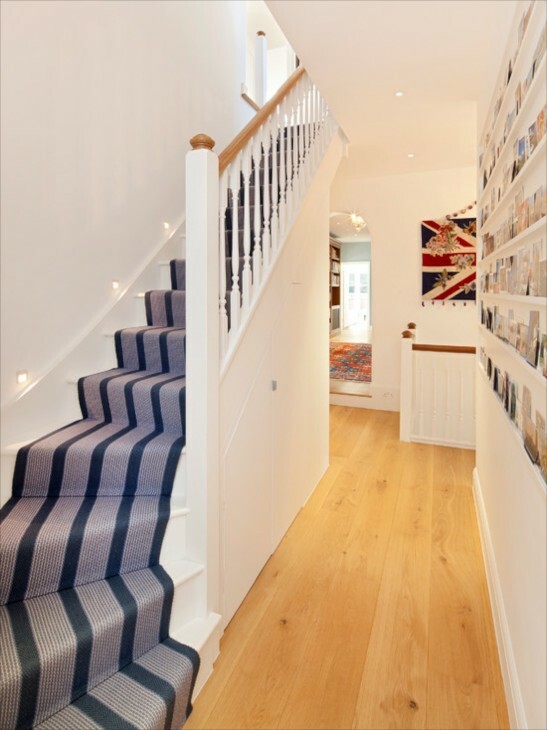 Stripes are a good choice in many applications. 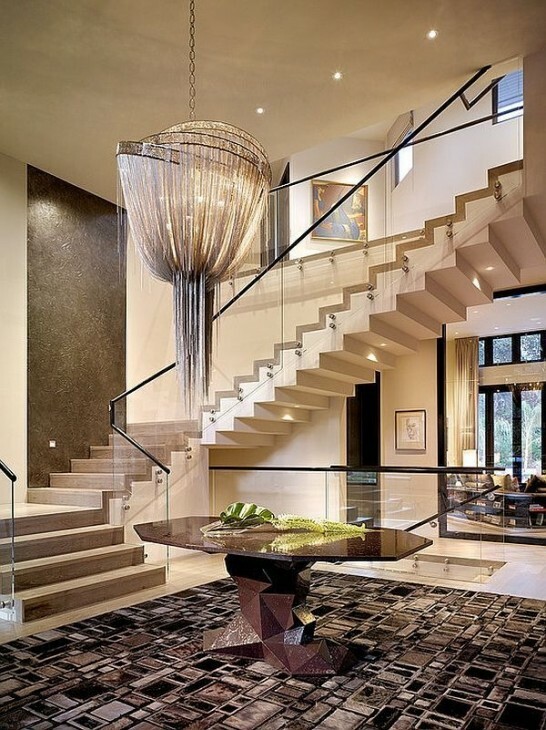 The use of stair bright silver colored rods reflected in the glass wall will make the user more aware. In this case a design statement also makes a good safety addition. Although you don’t see them very much, a curved bottom tread, and in this case, a second tread, to me, presents a hazard. 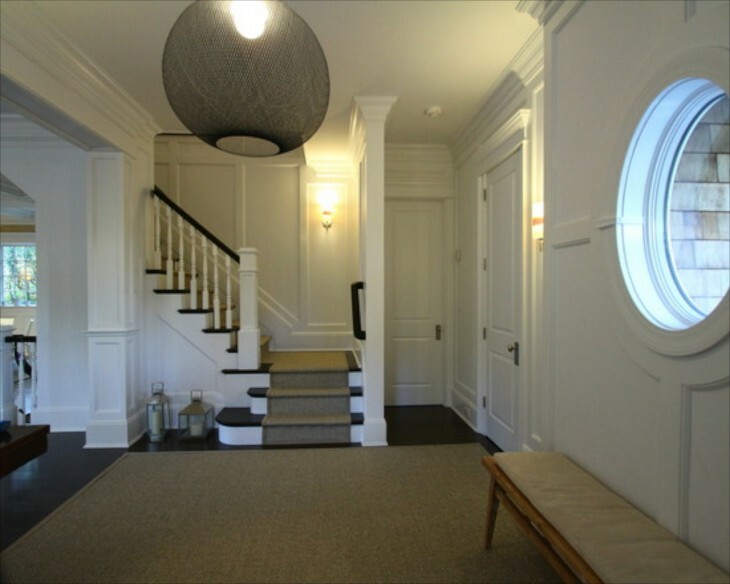 Good example of sisal in a formal foyer with nautical accents. Here a darker color really helps to emphasize the unique newell post. 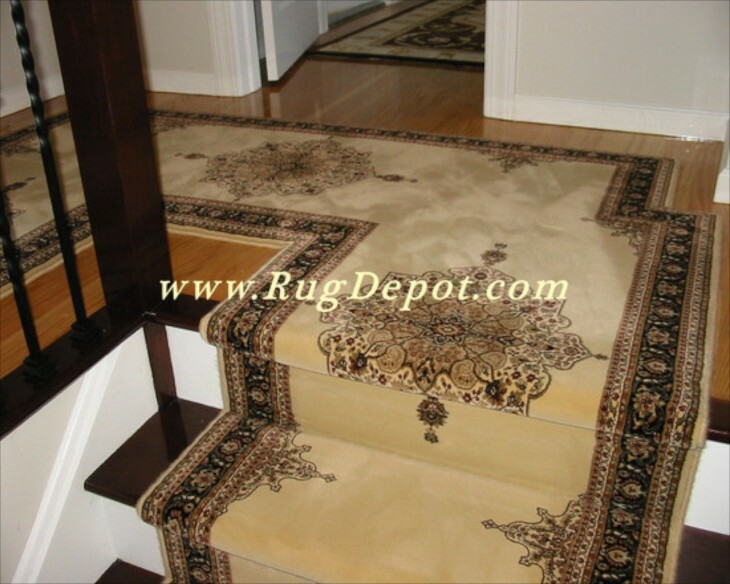 Here the homeowner chose to install the carpet all the way to the edges, It is a personal preference. 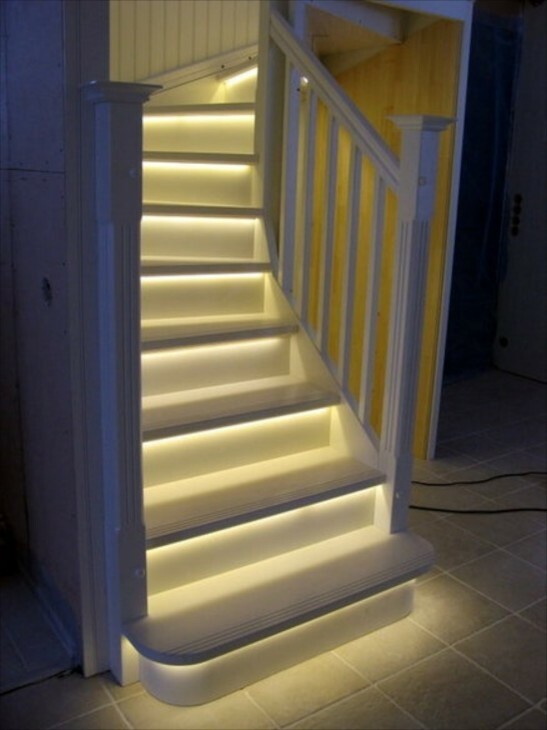 Because of the way the stairs are built, this installation will be easy to clean. Another wall to wall install. Traditional yet modern. The check carpet pattern is what brings it up a notch. Here sisal is edged in binding. The color choices for bindings are huge. Seen from the bottom of the stairs. 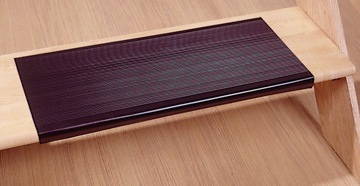 A typical pile carpet used as a runner. 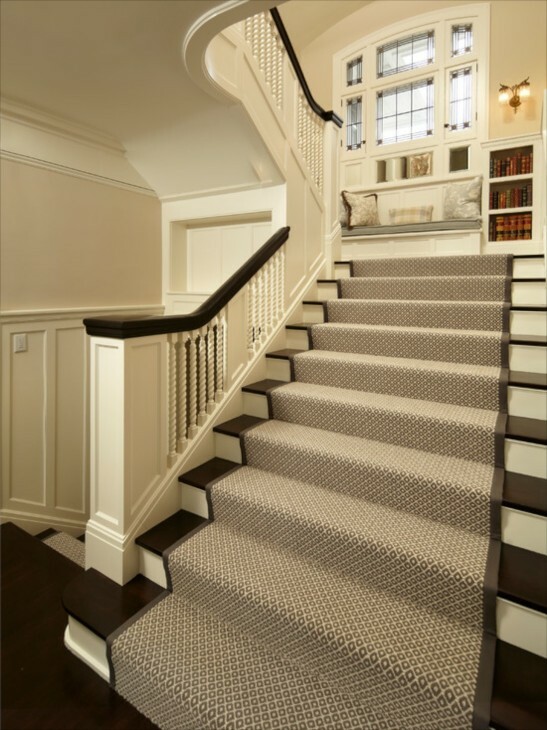 I certainly gave you a lot of illustrations, but in the hopes that if you are considering carpeting your stairs, you will find some information here to proceed with enough information that safety will inform your choices. The front edge of a tread is called a nosing. 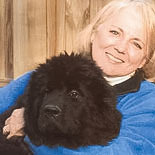 It can be flush or protrude up to 1 1/4 inches from the riser. Excellent article. Well done and helpful. Thank you! Hi Marty, I wished I could provide photos of these stairs from the top, but unfortunately, because most photos are taken to maximize the foyer view and for aesthetic purposes, there are rare times when the view is a “down” view, but you make a very valid point. 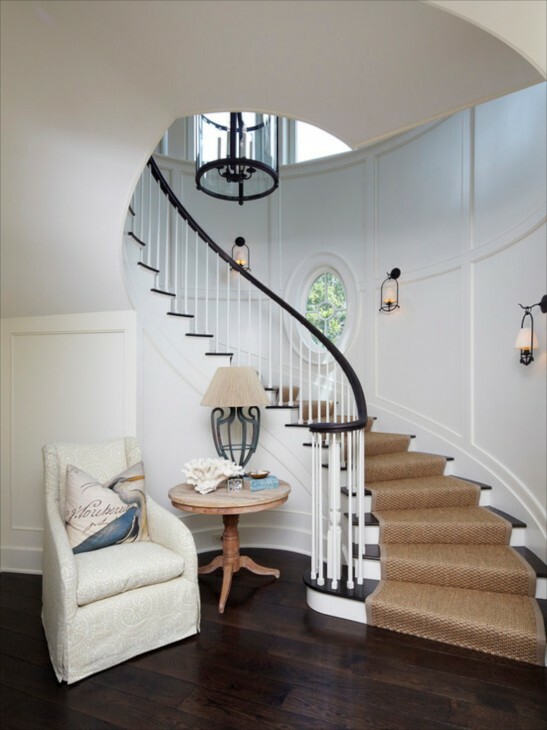 When I am in various homes as I design, I will try to remember to take a few photos from the top, and perhaps can do another article from that point of view. Thanks for commenting. Thank you so much. 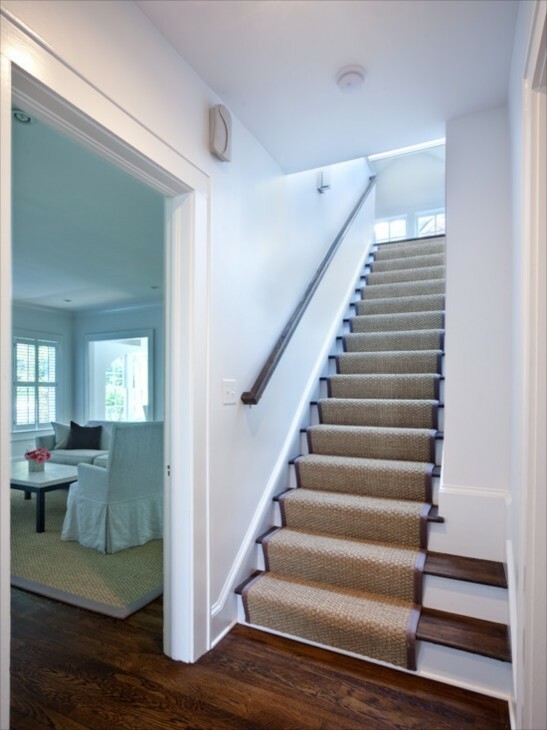 I can’t remember how many short carpeted stairs have have slid down because the edge of the stair had soft carpet with no support, mostly in bi-level homes. 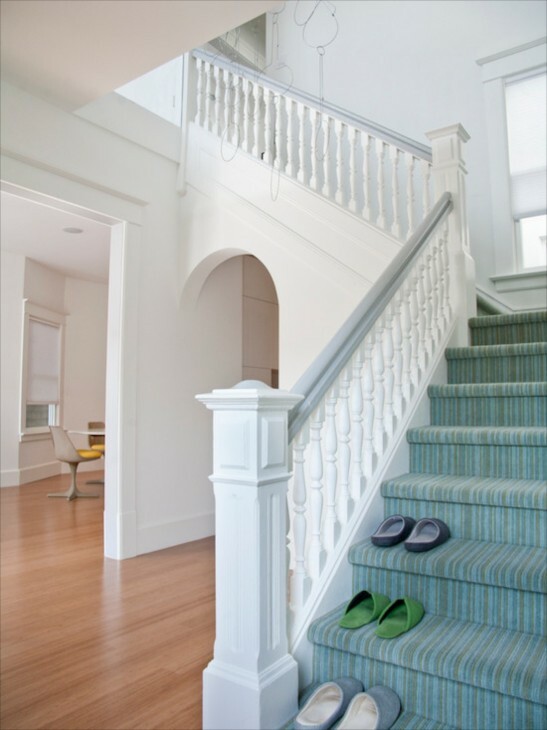 I see most of the stairs in this article have solid wood treads with a Tread cover/carpets that do not stick up, are smooth, thin and flat against the tread and have a surface that catches the foot only slightly, enough for the foot not to slip either going up or down. I wish builders would keep this in mind when building all homes, economy as well as luxury. Excellent advice and illustrations. The only challenge I have is locating a suitable carpet fitter. Virtually every fitter I’ve used previously has been questionable to say the least in relation to both workmanship and reliability. Any suggestions on how to source one in the Essex area who could take on work with the necessary attention to detail? Thanks, John. Thanks again. Love the read! It has really amazed me how unsafe many stairs are. 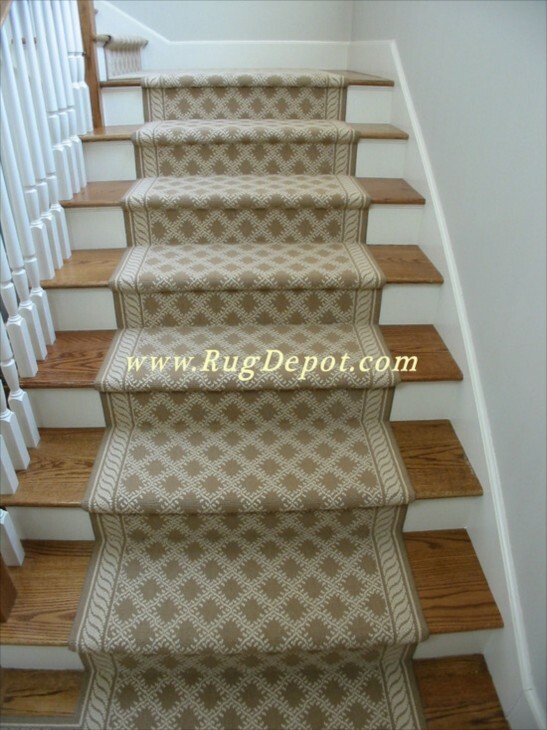 I cannot tell you how many I have seen that are too steep, with carpet poorly installed or too bulky to be safe. Back in Roman times they developed a mathematical formula for stairs that took into account comfort and safety to a degree, based on human locomotion. But the codes do vary. Humans are also taller now. We can all think back to stairs we have climbed, inside and outside, that we really have to concentrate to negotiate safely. Bravo! Just loved it, Charisse! Thank you! 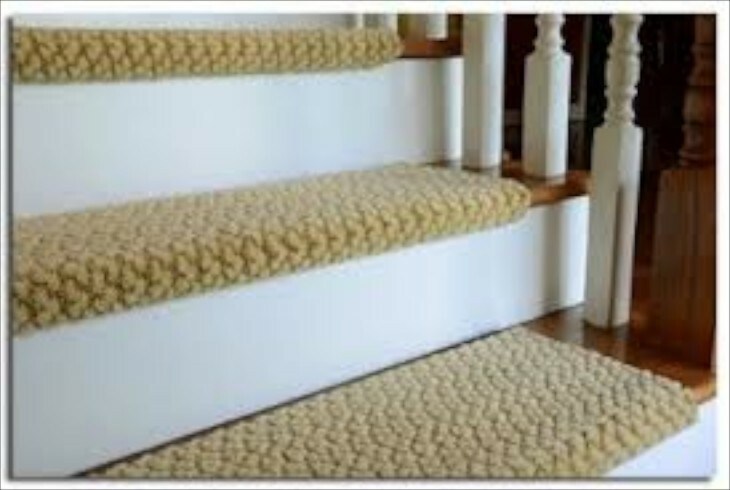 Regarding the sisal which I love: is the natural fiber sisal slippery or a better grip? Stores always try to sell the sisal ‘look’ and it’s just not the same to me…That eclectic strip was very interesting, you always show so many wonderful options. But the sisal is timeless and beautiful. Thank you again! 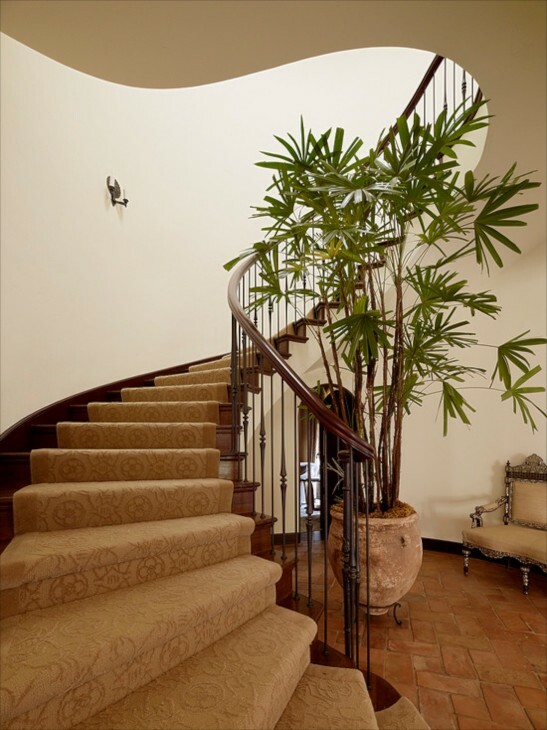 Yes, sisal is classic and never goes out of style. How slippery it is can also depend on the weave or pattern. I also like sisal blends and synthetic sisal. Here is a web site with good into and examples: sisal carpet I would go to carpet stores and get a feel for what you like as well as walking on it if possible. 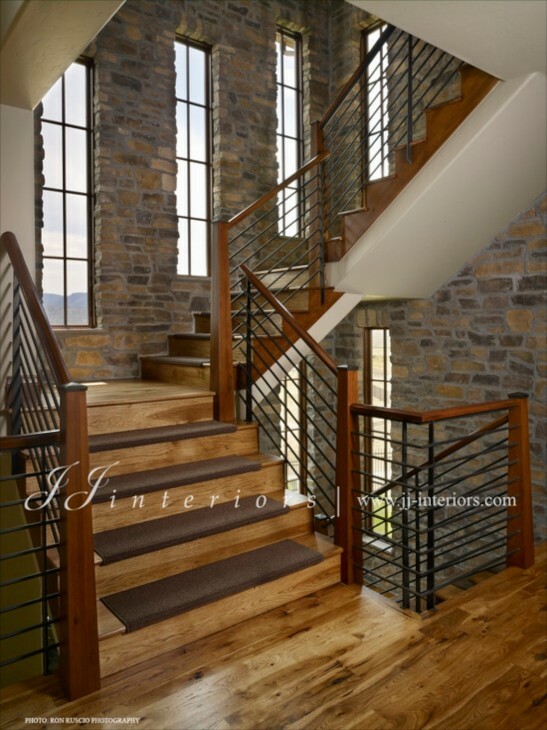 I have seen many too steep staircases that make climbing or defending the stairs, carpet or not a challenge. Each situation will be different.